Dipp will be back for another round on the Mothership in November. Dipp only appeared once during the game and never had the opportunity to go back on the air. The moment certainly blew up on social media and Dipp became a top trending moment on Twitter. After that moment, Dipp sent out a quick tweet shortly after going viral and a video introducing himself to American audiences. He has shown a sense of humor about the whole thing and has not tried to disown the moment. The day after, ESPN colleague Bob Ley defended Dipp saying he was proud to call him a colleague. ESPN producer Tim Corrigan, who at the helm in the production truck for the game, told Sports Illustrated that even though Dipp didn’t appear again during the game, he still impacted the telecast by giving off-air reports on injuries and updates from the sidelines. Since that time, Dipp has gone back to work for ESPN Deportes and has also been dealing with the Mexico City earthquake. He hasn’t said much about his time on the MNF viral report – until now. “I have always considered myself a team player and kept on doing my job. After my first hit, my focus was on letting my producer in the truck and Beth and Rex in the booth know, for example, that [Broncos guard] Ron Leary was in concussion protocol and then that he was out of the game. I let them know in each commercial break whatever new information I had. I always felt that I was doing my job and always considered myself a team player. I was letting them know what was happening on the field and I was not upset at all. 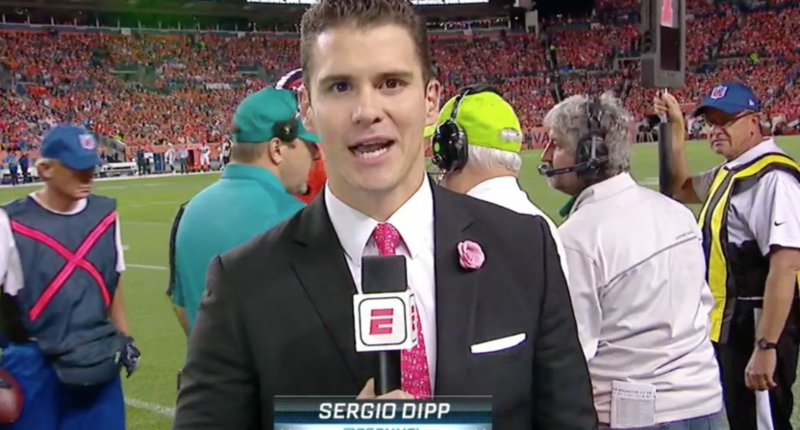 Dipp says while American audiences may have had their introduction to him on Monday Night Football back in Week 1, he’s been working in sports media for ten years and he’ll be back on the ESPN Mothership later this season. He’s been assigned to cover Patriots-Raiders game for Sunday NFL Countdown which will be played at Estadio Azteca in Mexico City on November 19. Dipp says he’s looking forward to the opportunity and appreciative that he’ll back back on the mothership again.